It’s easy for the layperson to confuse a stain with decay, but most stains have an external cause and are generally harmless, though they can be an eyesore. You can also mistake a stain for the discoloration caused by an amalgam filling, which can darken the surrounding tooth structure. Normally, routine hygiene therapy will remove self-imposed stains, but if any stain remains after the cleaning have the dentist check it out. Stains come in all colors and can be caused by many things, most of which aren’t good for you. Natural Discoloration — Most teeth start out bluish white when you are young and get yellow to grayish yellow as you get older. So if you used to have white teeth and they are now yellow, don’t panic. You may just be facing the things most of us try to avoid — the normal aging process. 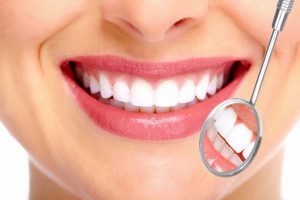 The white part of your teeth, the enamel, gets worn away with age, and because is somewhat transparent, the more the enamel is worn off, the more the yellow-colored dentin found directly under the enamel shows through. This is a normal process, unless the enamel wears off too rapidly. For example, if you are thirty years old and your teeth were white one month and yellow the next month, you may have a problem. Rapid wearing of the enamel can be caused by any number of factors: generically soft enamel, an abrasive diet, a highly acidic mouth, an acidic diet, rare diseases, overuse of an abrasive or acidic toothpaste, or a potentially harmful work environment. Green Stains — Green stains are most often found on children’s teeth, usually at or around the point where the teeth and gums meet, most obviously on the front teeth. The stain is actually on the membrane that covers the erupting tooth. Normally the membrane is sloughed off during the eruption process. If it isn’t, a simple cleaning should remove it. Brown Stains — Brown stains are usually caused by smoking or by chewing tobacco. They can also be caused by drinking a lot of coffee or tea. These substances will more readily stain plaque and calculus than your teeth. Many people think their teeth are stained when it is actually the plaque and/or calculus that is stained. Dark gray, yellow, brown, or black stains — There are discolorations that you should look for not only in your own teeth but also in your child’s. They usually indicate that the pulp ( the portion of the tooth containing the nerves and blood vessels) is dying or has died. It can be the result of decay, or it can be from a blow to the tooth. It doesn’t have to be a powerful shot to the tooth to kill it. A well-placed blow will cause the blood vessels in the pulp to hemorrhage; the blood then leaks into the pulp cavity and into the tubules in the dentin. The resulting dark dentin shows through the transparent enamel and you have a discolored tooth. The discoloration won’t show up immediately. If you are a parent you know that kids sometimes fall, so be sure to watch for this.